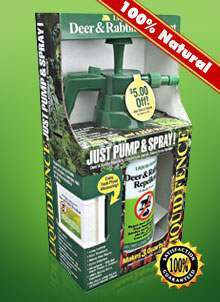 America’s number-one selling deer and rabbit repellent is now available as the Just Pump & Spray! Combo Pack. A sturdy, refillable, easy-pump, 48 ounce pressure sprayer and 6 ounces of Liquid Fence® Deer & Rabbit Repellent concentrate, enough to make a generous 3 quarts of guaranteed effective repellent. Just Pump & Spray! A super value AND a $5 mail-in rebate!! All natural, long lasting Liquid Fence Deer & Rabbit Repellent will stop deer and rabbits from eating your flowers, shrubs, vegetable plants, trees and vines. And rest assured, it won’t harm your plants or animals! It’s so effective, we back it up with a written 100% money back guarantee. Member tested and recommended by the National Home Gardening Club!